Sister Joan Mary Bannigan died on January 1, 2019, at Chestnut Hill Hospital , and was buried at Saint Joseph Villa on January 8, 2019. Joan was born in Newark, New Jersey, to Royal and Alice Bannigan. One of three children, Joan was baptized at St. Columba Church in Newark and attended the elementary school staffed by the Sisters of Charity. At an early age, Joan was influenced by the loving people around her, especially her brother Royal and her second grade teacher, S. Irene, SC. During that year, S. Irene invited Joan to become a religious sister and the seed was planted. At Our Lady of Good Counsel High School in Newark, Joan met the Sisters of Saint Joseph. An excellent student, yearbook staff member, and the proud recipient of three perfect attendance certificates, Joan loved school and her teachers, especially S. Marie Denise and S. Mechtilda. In her senior year, stirred by her early childhood memories of a religious vocation, Joan asked S. Mechtilda to accompany her to Chestnut Hill for an interview with Mother Francis Anita, Director of Postulants. Not certain she would be accepted into the Congregation, Joan also applied to nursing school. Ironically, both acceptance letters arrived the same day; needless to say, Joan choose her earliest inclination and entered the Sisters of Saint Joseph on September 12, 1963. In April of the next year, Joan received the traditional black habit, a new name S. John Alice, and began a year of deep prayer and reflection in preparation for taking her first vows. After that experience, Joan began her active ministry at Holy Child School in Philadelphia. Her first grade class had 104 students, and Joan was up to the task. Highly organized and with a strong work ethic, this young sister was a positive and supportive presence for her students. 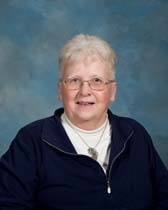 For 25 years, Joan taught students in the primary grades in the Archdioceses of Philadelphia and Newark before accepting a receptionist position at Wildwood Catholic High School in the diocese of Camden. For 18 years, Joan blossomed in this niche as she found the work both challenging and exciting. Only after severe pain make it difficult for her to walk did Joan leave Wildwood Catholic and became a resident of Saint Joseph Villa in 2009. Joan’s educational credentials included a degree in Elementary Education and additional graduate credits from Scranton and Villanova Universities. Caring for her ailing parents demanded her to leave her studies, and she did so willingly. Joan’s contemplative prayer life was nurtured by her mantra, “My Jesus, mercy,” along with Elizabeth’s words to Mary, “Blessed is she who believed the word spoken to her would be fulfilled.” Music, too, touched Joan’s soul. From the Broadway stage, “The Impossible Dream” to the spiritual “Jerusalem, My Destiny,” these melodies indicated her deep desire for union with her God. Early in 2019, Joan slipped into the arms of the Lord she loved so much. “Blessed is Joan who believed the word spoken to her would be fulfilled.” Thank you, Joan, and may you at last rest in peace.